Peppermint has been used as an herb in cultures around the world for hundreds of years. In TCM, "Bo He" can help kick out a cold, clear the head, and promote circulation to relieve stress. In Western herbalism, peppermint supports the digestive system, improves cognitive function, benefits the upper respiratory system, and provides relief to aching muscles. Why use peppermint essential oil instead of the herb itself? The essential oil is more potent - Young Living's Peppermint oil is as strong as 26 cups of peppermint tea! - and will last longer because while herbs can decay over time, a properly kept bottle of pure essential oil will never expire. Plus, the essential oil can be used internally, topically, or aromatically as is (see below), while the herb would need to be decocted or prepared in some way. If you're interested in getting started with essential oils, come to one of our classes or visit our sister site Oil Isle for more information. 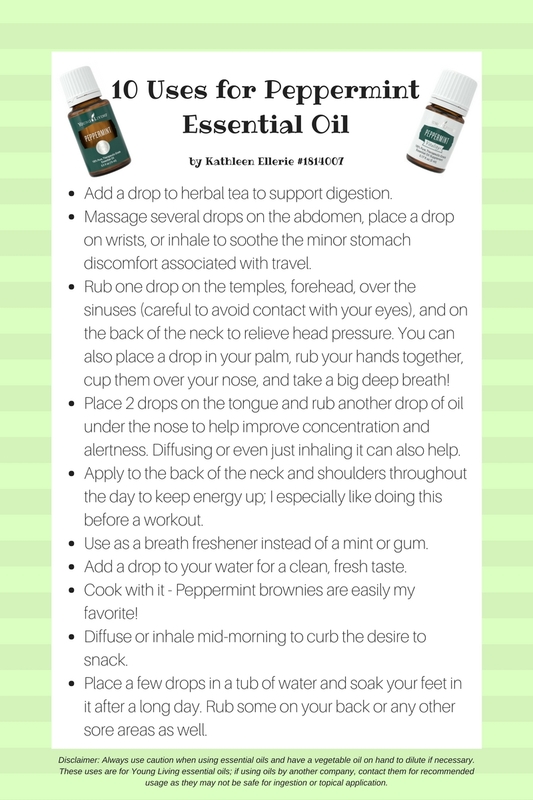 We sell some oils at our clinic as well - including Peppermint! - so you can take what you've learned and start experimenting immediately.